A 100 foot spiral tank like the Lomo Pro is great, if available. The metal spiral for 100 to 200 feet would be an alternative. Stacking spirals would be nice, too. That would be a good start. 100 feet of black and white 8/16/35mm film. A 400 foot machine of some sort would be next to try. Then, rem-jet removal and color processing. One thing at a time. My last effort used PF-2 and the fixer was cold because of winter. It took more than half the 8 minuets fixing time to warm it up. So, there is some yellow color remaining. This was printed using a Bolex H16T camera with bi-packed film from a 7222 negative. Yes. I limit filming to black and white. Developing at home is easy to do that way. Printing is also done and that gets complicated. 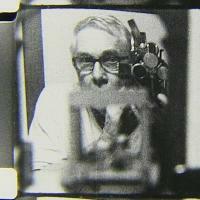 I am 72 and want to find other people to make 16mm black and white films with in Pittsburgh. Bolexs, Zoom H4N, Darkroom, Lomo Pro, Uhler printer. And if you are older than me that is OK. Younger too. Thank you both for those lists. Some are on eBay. One seller of a 79 dollar auto eye 16mm camera does not know if the exposure part works, just the motor. Tyler, shooting manually with 7363 outdoors is difficult when cloud cover is variable, which is most of the time. The slightest change in brightness shows. The film has no latitude. It'd be great not to worry about that. Yes, scoopic, the Filmphotography guy has some videos using one. Just saw it. Automatic exposure is missing on all my 16mm cameras and lenses. The Bolex zooms with it never seem to work. Does someone fix them? Is auto exposure even used in 16mm? Scoopic? Can they work? Well, don't point the lights in people's faces, rather, bounce the light off the ceiling or off a wall.